The Indian of the Plains had few options in the 1860s and 1870s. The buffalo were gone and hunting lands were being taken over by white settlers. With this dissipation of their food source came displacement resulting in inadequate food supply and (in many cases) starvation. The government offered reservation systems, but these in general flawed results of flawed and hurried thinking. In one attempt to determine the efficacy of the government's response to the growing crisis in caring for the removed Indian population, a committee under the titular leadership of Senator James Rood Doolittle of Wisconsin (Republican turned Democrat, 1815-1897), created in January 1867 a report (The Condition of the Tribes, Report of the Joint Committee...) containing a wealth of information about the state of Indians on the reservations, drawing on the results of a questionnaire completed by 27 high-ranking respondents in Indian affairs, including eleven army officers, thirteen agents or superintendents, one teacher, one missionary, and one physician. It does not paint a pretty picture, even coming at the hands of a Congressional investigation. There wasn't much pretty in the physical outcome of this thinking--to construct "flying" tanks for quick maneuvers into battle situations--but I think that I like the thinking in it, especially as it seems that the aircraft-end of the tank was re-usable. Still, there was the whole "landing" part of the operation, which meant that (at this time, anyway) the tanks had to be placed and not parachuted to the ground, which also means that the armor would be relatively removed from the field of battle. But this would be better than driving the things there, or hauling them all on a train for quick transport. What is done by what I call myself is, I feel, done by something greater than myself in me.—Comment made by Maxwell to the Reverend Professor F.J.E. Hort in 1879 when terminally ill.
[Both quotes found in Fred Seitz's article in the Proceedings of the American Philosophical Society, March 2001, "James Clerk Maxwell, (1833-1879), Member APS 1875". This note may restrict itself to a small population of readers of this blog, but I'm always fascinated to come upon notices of the reading habits and library book-borrowing practices of significant people. For example Herman Melville's reading has been particularly studied, with scholars hunting books that had once belonged to him and then dispersed at auction (some going to the Brooklyn Public Library), and there are records of his borrowing practices at the library as well. Thomas Jefferson's reading habits is a well-known and fascinating study (though he did little borrowing, per se, what with there being few borrowing libraries for him to visit, and then of course his library was much larger than anything else remotely close to him). 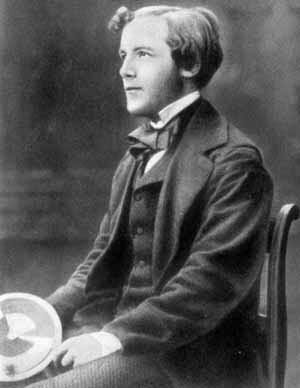 This is the main reason why my interest was piqued when I read this biographical treatment of James Clerk Maxwell (1831-1879) in the 27 October 1881 issue of Nature magazine. It mentions the while the great Maxwell was not-yet-great, studying at the University of Edinburgh (which he attended from 1847-1850, when he was just sixteen), that he used the library there extensive, and that the library has "records" of that reading. The article quotes P.G.Tait from an 1879 article in that same journal (Nature, volume XXI, p 317) that during the years at Edinburgh "without keeping the regular course for a degree", Maxwell "carried home for study..such books as Fourier's Theorie de la Chaleur, Monge's Geometrque Descriptive, Newton's Optiks, Willis' Principles of Mechanisms, Cauchy's Calcul Differentiel, Taylor's Scientific Memoirs, and others of a very high order. These were read through, not merely consulted." I'd like to see the whole list, though as yet I've not been able to find it, and I've not yet been able to find the right person to speak with at Edinburgh to determine whether there is a full list of Maxwell's borrowing habits, or not. It would be an interesting thing to see. After all, the man did basically invent modern physics, and it was his portrait among the very few that were displayed in Einstein's house at 112 Mercer Street. I’ve not seen this picture of the nine cowboys who starred and started the Great Cowboy Race of 18931. They gathered with a frenzy on the little town of Chadron, Nebraska (population 2,000, which doubled in size as the event’s opening grew near) determined to announce the “best “ cowboy, the first to cross the finish line near the Chicago World’s Fair of 1893 and shake the hand of Buffalo Bill Cody (well on his way to becoming a shell of what used-to-be). The contest was supposed to take two weeks and average 50-75 miles a day, which is a lot to ask of a team of horses (and the riders). So there was the expected shenanigans, and the man who "won” evidently helped plan the secret route, and someone else rode a trains with his horses for a bit, and so on. Ironically these cowboys were racing to the cosmopolitan host of the World’s Fair in which the historian Frederick Jackson Turner read his paper "The Significance of the Frontier in American History," —a significant theoretical piece announcing why Americans are so different from Europeans, and also that the American frontier had clearly, absolutely, been broken and installed in the gauzy national psyche. The fate of the Cowboy had already been determined 20 years before with the introduction of refrigerator cars, railroad expansion and barbed wire--all of which cut the West into smaller and smaller parcels, until they restricted the Cowboy to its own Reservation. A crooked race to Chicago seemed to crystalize the Cowboy's tenuous grasp on existence, depicted finally by the new(ish) half-tone photo process of Stephen Henry Horgan, making a half-portrait of empty circles, the image disappearing more and more the closer we look at it.. It was just a sorry show for the cowboy all the way around, and a story that doesn’t need to be told here. I did just want to publish this picture. There’s a long and good story here http://www.thelongridersguild.com/chadron2.htm about the entire affair. Emmett Abbott riding Outlaw and Joe Bush. Joe Campbell riding his one horse, Boom-de-aye. Davy Douglas riding Wide Awake and Monte Cristo. Old Joe Gillespie riding Billy Mack and Billy Schafer. George Jones riding Romeo and George. Charlie Smith riding Dynamite and Red Wing. Rattlesnake Pete Stephens riding General Grant and Nick. Doc Middleton riding Geronimo and Bay Jimmie. Q: How Long Did the Classic Cowboy Age Last? A: Not very. I imagine that there have been significantly more people who have played cowboys in literature, on radio, in movies, on the stage and on television than ever cowboyed in the West. This doesn’t include children who have played at “Cowboys and Indians” over the past 150 years. The time of the classic cowboy-in-all-his-glory was short—maybe two generation. Probably less. And there weren't that many people to fill in those positions in that short period of time. Certainly there are cowboys to this day, but the cowboy of our mind’s eye—that iconic cowboy of the expanding, post-Manifest Destiny West—was a victim of the great rush to land privatization in the 1880s-1890s: barbed wire and other fences took the cowboy's place. By 1895 there were more cowboys riding fences than herding cattle. As Faulkner wrote on the "last individual" in The Fable (page 204), “the cowboy was exterminated from the earth by a tide of men with wire-stretchers and pockets full of staples…” Of course Faulkner also saw the cowboy set among horse dung and "oxidizing cans" of sardines and tomatoes--a gemeinschaft/gesellschaft thing. There are only 40 or 50 years that separate cowboys Texas Jack and Ned Buntline from the Chandler/Marlowe and Hammett/Spade modern detective West of San Francisco and Los Angeels, which is an extraordinary thing. There weren't cowboys stretching back forty years before Texas Jack, and there weren't forty years that they stretched into the future from him, either. The distance in time that the cowboy existed, all things considered, was short--from the Reconstruction free-roaming Texas cattle of 1866 to the appearance of barbed wire in the early 1870's to the refrigerated railroad car of just about the same time to the endless farming non-frontier of the 1890's, the cowboy enjoyed probably one full decade of not being molested by the present; the future caught up with them in a quick hurry. Tech-Quiz 6: A Square Peg in a Round Hole? Or is it a round hole fitted around a square peg? And what is it that is patentable about what follows? At first glance this math teaching tool looks a little on the obvious/antique/useless side, but I think that there are some good points to it in helping small children understand the concept of what a number "is" and relating the processes of addition and subtraction to the relationship of "numbers" to "things". This certainly seems more beneficial and utilizable than the current practice in my daughter's third grade class, where a simple subtraction problem is turned into a double addition problem employing a number line, all in the name of teaching the children the concept of "number" and doing away with algorithms. I think that by the third grade, the concept of "number" has been established, though the board of edu-selection might be trying to re-visit a lost point of development somehow. This is made intoan addition problem, 345+ ____= 456. The addition problem is turned into a number line, with 345 on the left far end and 456 on the right. The children are told to add the requisite bits to 345 to get to a "zero unit" for each place value, and then add those for the solution to the problem. So: 345+5= 350, 350+50=400; 400=50=450; 450+6+456. Add the 5+50+50+6= 111. In this confusion a stab at the heart of understanding the concept of "number" has beenb made. A step back from this would be a wise move to make. Tech-Quiz #5--Not a "What is It? ", but "Who Done It?" This was a major piece of early thinking on spread spectrum communications and frequency hopping--butter for the bread (or bread for the butter?) of wireless communication--with the piano roll tapes replaced by electronics. The idea didn't go anywhere in 1942--it did, however, go far, beginning in the late 1950's. The major name listed on the patent report is a major name, but not in this form, and not in this area--some might find it very surprising to know the more popular version of the inventor's identity, and the industry in which the inventor worked. The Monroe calculator must have seemed the same sort of inspired salvation to the 1930's generation as the hand-held Texas Instruments calculator (with paper feed!) that I saw displayed in a glass-domed pedestal at Barnes and Noble in Manhattan in 1973. Small, compact, and with fantastic calculatign capacity--and expensive. It was in a very real sense a glimpse into the future. For the general, garden-variety Monroe, it certainly offered its users a much smaller, tidier machine than some of the brutes of the decade or two preceding it--make no mistake, there were some big bruising accounting Monroes that were truck busters. Monroe is an old company (begun in 1912) company that produced hand-cranked and electromechanical calculating devices. The Monroe salesman's handbook that I have here from 1929 shows versions of their machine that were lightweight and versatile (at 38 pounds) to behemoths for insurance companies that were truck-haulable. Monroe became part of Litton before reappearing again on its own, trying to compete in the hand-held market with its own electronic display calculator--a device that cost $269 in 1972. Monroe was basically "done" by the 1960's. I think that for most people Texas Instruments is produced hand-held calculating devices--it is of course a vast concern, with a long history that gets catapulted during WWII when the formerly geology-based company gets involved in military electronics. Fast forward, TI created FLIR and MERA, laser-guided control systems for PGMs (laser-guided bombs/precision-guided munitions), launch and leave glide missiles, and so on. IT was also involved in the earliest work in microminiaturization, producing (by Gordon Teal) the first commercial silicon transistor (1954) and the first integrated circuit (by Jack Kilby) in 1958. And so on. Its a big, old company. And as much as each company was offering a similar god-send to their generationally-distanced mathematician/number cruncher, TI simply didn't have ads like Monroe. And I've always iked to see numbers-on-the-move. Paul McCartney1 dreamed the song Yesterday, Gandhi dreamed the source of non-violent resistance, Elias Howe dreamed of the construction of the first sewing machine, and Mary Shelley the creation of her novel Frankenstein... For good or for ill, William Blake was evidently deeply influenced by his own dreams; on the other hand, Rene Magritte was deeply influenced by dreams but didn’t use any of his own for his paintings. Otto Loewi turned an old problem into not one in a dream, finding a solution to the prickish problem of whether nerve impulses were chemical or electrical (and resulting in the Nobel for medicine in 1935); the fabulous discovery of the benzene ring came to August Kekule in a dream as well. Artists have been representing people in dreams and dreamscapes for many centuries: Durer depicted a dream in a 1525 watercolor, for example, and thousands of artists have depicted famous biblical dreams (Joseph of Pharo) for long expanses of time. I've felt that a great history lesson for school kids would be to make them keep a diary for some other kid from some other time, introduce them to the minutiae of life from another time and perhaps another place. With some guidance they could make interesting entries in their diary for, say, 15 June 1897, writing about chores, the daily schedule, what they studied in school, how they were dressed, how they got food on the table and kept the house clean, how they would spend 25 cents, what they would see from some given vantage point, and on and on. This could take place in their very own home town; it could be multi-generational, requiring them to talk to the scary white hairs, or it could reach far back into history and be of an entirely different place altogether. After they were assigned a particular place in time and space, you could give the kid subtle hints, like this one (below), asking them what they thought it might mean by dialing the phone number 200 80 in Warsaw in 1941. And what did that pair of lightning bolts mean, anyway? I think that once they were made to figure it out for themselves, as though they might've been there, and then could record their feelings and observations in a diary might actually bring history to life (especially once they had their "holy crap" (and probably worse) moment at what these numbers implied). This looks like an every day diary for the period, except for the Nazi (or NSDAP) regalia and German imprint of Generalgouvernement in Krakau. And, all of the annotated high points of the year for the most overly voracious parts of German militarism as well as for the hot points of Nazi history. Hitler, (above) Goering, Goebbels and other leaders' birthdays are highlighted, not to mention seminal points in the development of the Nazi party and party-adoptees (Richard Wagner has a number of entries for suggested celebrations). There are also helpful directories in the back pointing to any number of cafes located in a growing number of "Adolf Hilter Platz's" throughout Poland (including three in Radom), as well as fares for the use of the railway and postal system. We also see the following telephone number: 23075. That's for the Literarische Kaffee Stefansgasse I, Krakau. This is the location that the Reichsminister and administrator Hans Frank (about whom we'll read in a moment) decided to hold a chess tournament in 1941, to satisfy his own need for chess while freshly in the pursuit of the murder of millions of people. The first published photographic image, or "sunpicture", illustrating an excellent collection of extremely early papers on photography, 1839. "On April 20, 1839, the London magazine The Mirror of Literature, Amusement, and Instruction, featured as its cover a "Facsimile of a Photogenic Drawing." There is a copy in the George Eastman House collection. It is a picture —in negative—of three stalks of leaves. The original was made by Golding Bird, "a distinguished botanist" by following William Henry Fox Talbot's newly invented process, the details of which were made public at the Royal Society on February 21. Paper was made light sensitive by bathing it first in sodium chloride solution, then, after sponging the surface, in a solution of silver nitrate. The material could be used in two ways: to make, as Golding Bird did, a contact print, pressing flat objects to the surface during exposure to light, or in a camera. Both techniques produced negative images, which were fixed in a strong solution of sodium chloride. Talbot named his invention "photogenic drawing." His friend, Sir John Herschel, proposed for it the word "photography." "Only a week later, on April 27, The Magazine of Science and School of Arts, another London magazine, featured three "Fac-similes of Photogenic Drawings" on its cover: two botanical specimens; (Fool's Parsley and Grass of Parnassus), and a piece of lace. Although wood engravings created by skill of hand, they approach photography more closely. For the very wooden block used for the printing plate was itself sensitized, just as Bird's paper had been sensitized, and the engraver followed with his burin the photographic image itself, rather than the artist's drawing." "The photogenic drawings were contributed to the magazine by a reader who signed himself "G.F." He commented, in his covering letter published in the same issue: "I send you three drawings of this new art, which were impressed at once on box-wood, and therefore are fit for the graver, without any other preparation. I flatter myself that this process may be useful to carvers and wood engravers, not only to those who cut the fine objects of artistical design, but still more to those who cut patterns and blocks for lace, muslin, calico-printing, paper-hanging, &c., as by this simple means the errors, expense, and time of the draughtsman may be wholly saved, and in a minute or two the most elaborate picture or design, or the most complicated machinery, be delineated with the utmost truth and clearness." Gernsheim states in his History of Photography that the first photographic camera ever made for sale to the public was advertised by Francis West, an optician of 83 Fleet Street, London, and published in this issue. Bird later reworked these sections of the Mirror into elements of and a chapter in his Elements of Natural Philosophy; (being an experimental introduction to the study of the physical sciences; revised and enlarged third London edition, Philadelphia: Lea & Blanchard, 1848). This article was reproduced in the Journal of the Franklin Institute in September 1839 as "Observations on the Application of Heliographic or Photogenic Drawing to Botanical Purposes; with an account of an economic mode of preparing the Paper: "in a Letter to the Editor of the magazine of Natural History". "That was when I saw the Pendulum. The sphere, hanging from a long wire set into the ceiling of the choir, swayed back and forth with isochronal majesty.. .The time it took the sphere to swing from end to end was determined by an arcane conspiracy between the most timeless of measures: the singularity of the point of suspension, the duality of the plane's dimensions, the triadic beginning ofn, the secret quadratic nature of the root, and the unnumbered perfection of the circle itself... Were its tip to graze, as it had in the past, a layer of damp sand spread on the floor of the choir, each swing would make a light furrow..."--Umberto Eco, Foucault's Pendulum. I've uploaded an interesting recrod to the books for sale section of this blog on the great experiment of Leon Foucault (1819-1868), who was the first to actually demonstrate the rotation of the Earth, doing so with a very simple, extraordinarily elegant experiment involving a heavy brass bob suspended from a long cable--a pendulum that was unencumbered and free to swing along any plane. It is the curvature of the Earth that allows the tip of the bob to make its pattern, and it is the fact that the Earth is rotating under the moving pendulum that allows it to be tracing this path at all--it is also tells the difference between living on a sphere and living on a plane.